Folk music is considered to be music that originates from the people. It is not the preserve of professional composers because its themes and melodies are derived from the experiences and lives of people who usually have no professional musical training. The lyrics are usually an expression of social or personal conditions. Work songs are a common folk theme and are an excellent example of community and the lives of those who exist within that community. Sea shanties and farming songs are two types of folk music that have work related themes. It is only natural for communities to express their joy at the arrival of spring and the promise of a bountiful harvest or for sailors to celebrate their arrival home after a long time at sea. Folk music before modern recording tended to be regional and sung in local dialects. The invention of sound recording meant that for the first time these regional songs could be captured and preserved and heard by people from different backgrounds and countries. Folk music had always been passed down orally from generation to generation but industrialization had led to the fragmentation of traditional rural communities as people moved to industrial urban towns and cities. Musicologists became very aware that the old songs were disappearing and soon there was a movement to capture the songs using the technique of field-recording. Alan Lomax is one of the most famous of these early scholars who took to the roads of America with the aim of recording folk music for the Archive of American Song of the Library of Congress. In England the work was done by the composer Percy Grainger. Despite all these changes, folk music will always have its place in society. The form that the music takes may change but never the reason for its existence. The recording of an old Lead Belly (Huddie Ledbetter) song "Goodnight, Irene" by The Weavers in 1949 revived general interest in folk music and gave rise to a new movement in the 1950s that was called the American folk music revival. The next decade saw the distinction between popular music and folk music becoming blurred. 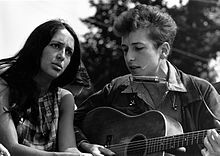 In the US and many other countries, folk music and folk guitar became very popular and musicians like Bob Dylan wrote contemporary folk music that encapsulated the feelings and politics of the 1960s. This style most often uses an acoustic guitar, open chords, simple chord progressions and vocals. You can play folk guitar with a pick, or by finger picking. This style is simple, yet diverse enough to let you play a variety of tunes. These are songs that have become immensely popular, such that many people can sing them communally though they may need prompting to remember the next verse. Although these songs can often be performed on an acoustic guitar, they are not quite "folk". You are encouraged to learn these songs and perform them with the view of encouraging others to sing along. This section will provide the basics of folk guitar. By taking open chords and learning some common (and important!) chord changes, you will learn the principles of folk guitar. This is an E major changing to an A major. This is one of the easiest progressions to play since the chord forms are so similar. This is a C major changing to a G major. This is a D major changing to a G major. This is a F major changing to a C major. This is an A minor changing to a C major.